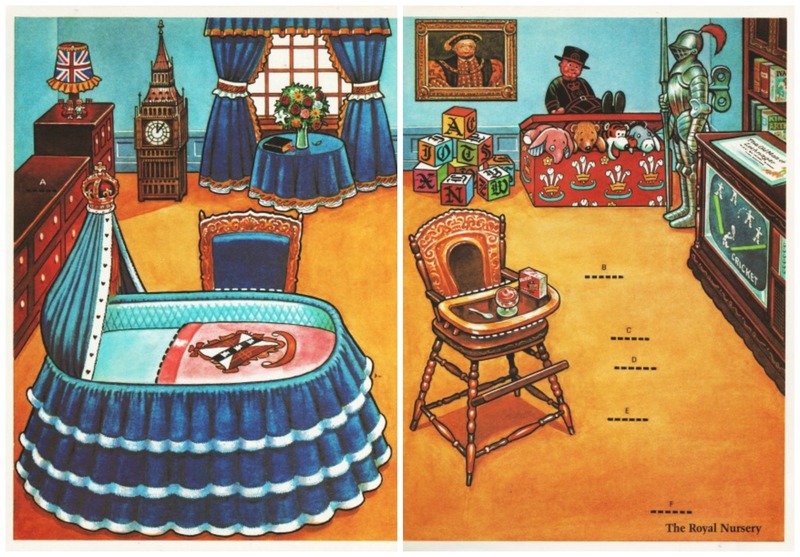 Royal Baby Watch- It’s A Boy! The royal baby watch is over. Twitter has exploded with the news that the Duchess of Cambridge, Kate Middleton has just given birth to a baby boy and Prince George and Princess Charlotte have a new brother. Journalists and photographers from around the globe have been camped out in front of St Marys Hospital in Paddington, West London for some time. It’s the very same private hospital where third time papa Prince William was born. Long before the newest Royal was born, the souvenir market has been cashing in.For months commemorative memorabilia has gone into production for Baby Cambridge, flooding UK shops. The last time the world went on a rabid royal baby watch was 36 years ago in June of 1982 when Princess Diana and Prince Charles welcomed the birth of Prince William. Just as today, the wave of royal baby fever spread across the pond to the US and the anticipation was palpable. The buzz was as frenzied over Diana’s first baby as it is over Kate Middletons as office pools speculated whether baby would be a boy or a girl. For a brief moment in the late spring of 1982, Reagan era Americans forgot about Thriller, ET and the rising cost of gas (a whopping 91 cents a gallon) and got caught up in a real life fairy tale happening overseas. 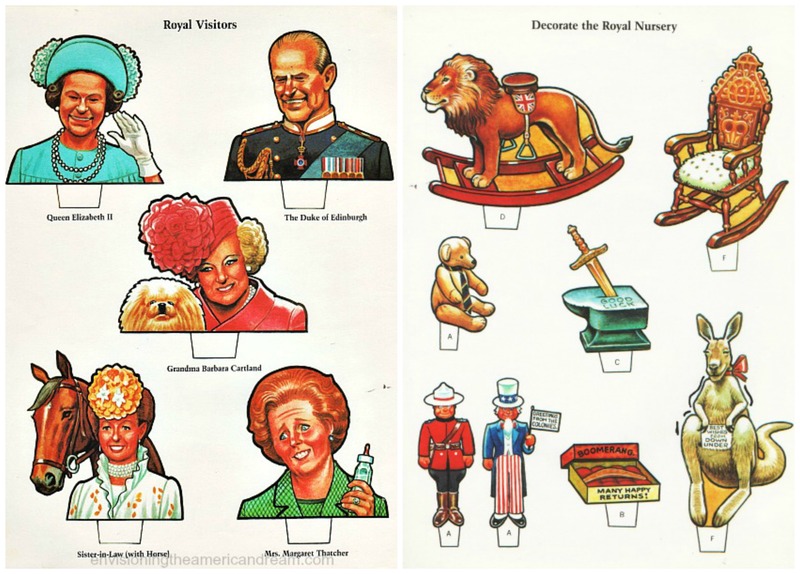 American fans of that golden couple, Prince Charles and Princess Diana could have fun browsing through the commemorative memorabilia. 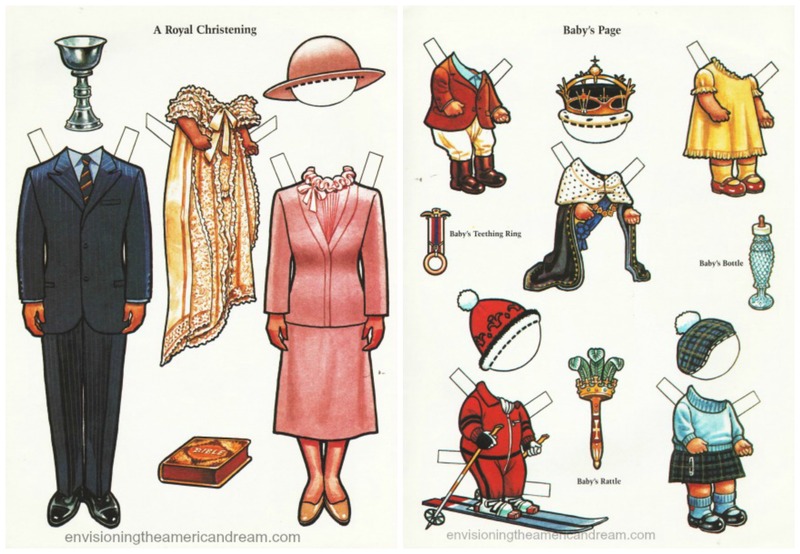 For the millions who couldn’t get enough of this 20th century fairy tale there appeared a paper-doll book cheekily called “Chuck & Di Have a Baby” by John Boswell Patty Brown and Will Elder. 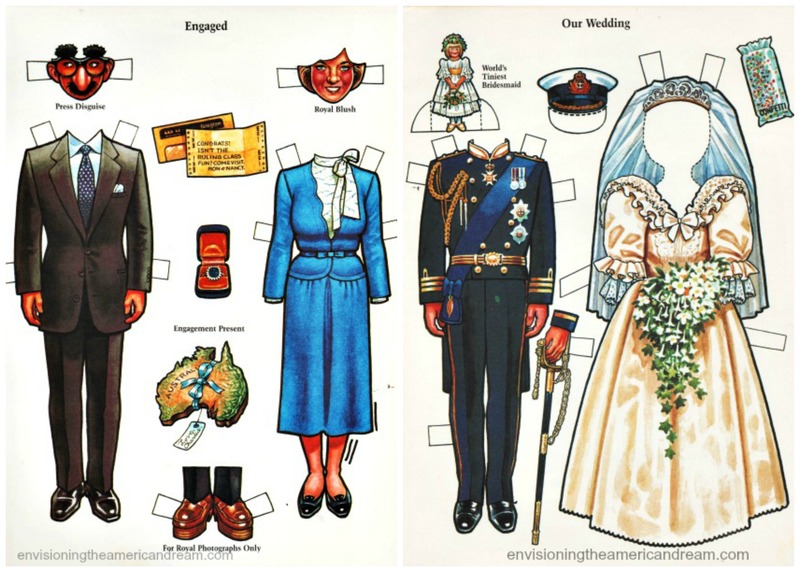 Published by Simon and Schuster right before the actual birth of the Duke of Cambridge in 1982, it featured cut-outs of Charles and Diana and the anxiously awaited Royal Baby. 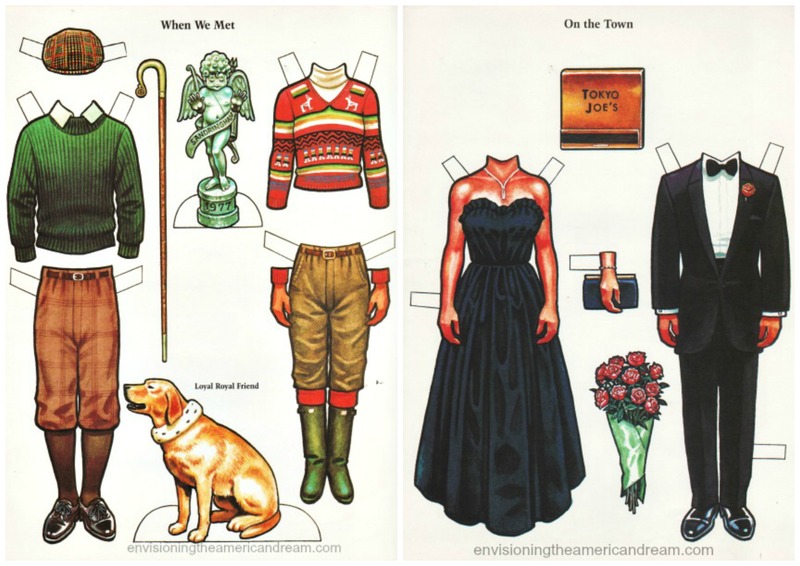 Outfits for Charles and shy Di’s early dates. We were still aglow from the fairy tale wedding of the century that had taken place the previous July. Charles was still Prince Charming, his beautiful shy Princess was still smitten with him; any whiff of scandal lay far into the future. 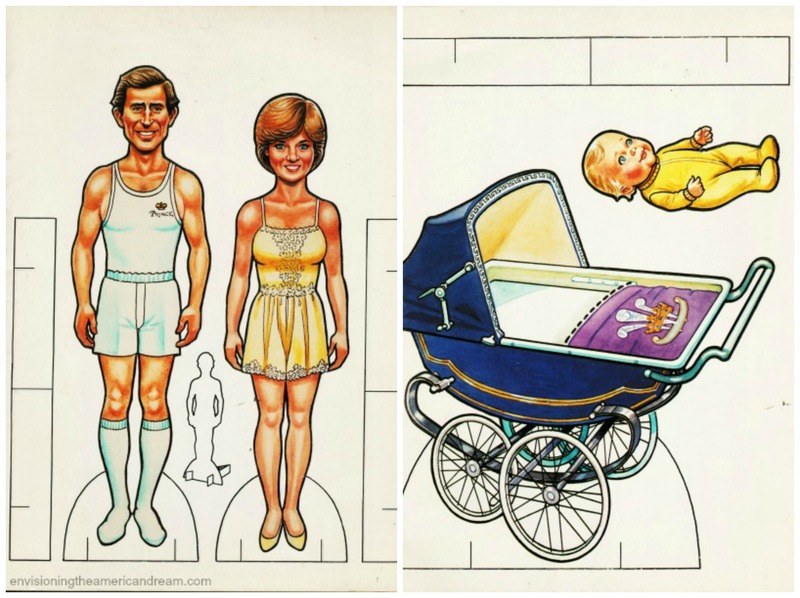 Less than a year later, The Princess of Wales was pregnant and like most modern couples, Prince Charles and his wife took natural childbirth classes. 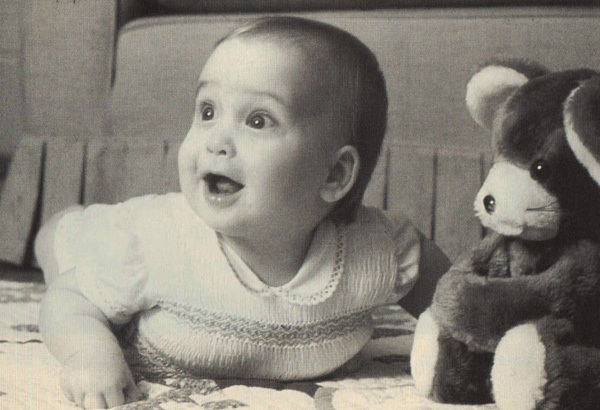 The media baby watch had reached fever pitch and at one time Diana was even photographed on the beach in a bikini. It got too much for Diana she asked her doctor to induce labor choosing a date that would not conflict with the Prince of Wales busy polo schedule. On the early hours of June 21 she and Prince Charles headed to St Marys Hospital in London’s Paddington area. This most thoroughly modern baby would be the first British heir to the throne to be born in a hospital. Diana had overruled the Queen who wanted to follow tradition and have the future monarch birth take place within palace walls.. The birth would take place in a 12 by 12 foot $218 a day room in the Lindo Wing of London’s St Marys Hospital. Like a good Prince, Charles was at his wife’s side throughout the delivery. making it the first time a British heir to the throne had witnessed his own child’s birth. 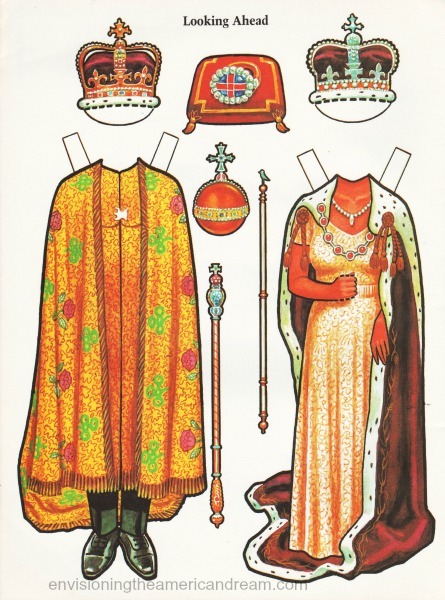 By contrast his own father, Prince Philip had been playing squash with an equerry while Charles was being born. In lieu of social media, a hand lettered cardboard sign was posted on the hospital gates : “It’s a Boy.” Church bells pealed, cannons boomed and throughout the kingdom toasts were made welcoming the future king. To the cheers of the throng they paused for photographs and sped off for their new home. Only 5 weeks earlier the couple had moved from their cold, impersonal rooms at Buckingham palace into spacious new quarters at Kensington Palace. The first full week of his life the infant was simply known as “Baby Wales” When finally speculation on the baby’s name ended when the palace announced that he would be named William Arthur Philip Louis.